Ann Poore grew up an army brat — her late father, she jokes, would have emphasized the latter part — who spent her formative years in northern California in the late ‘60s. She came to Salt Lake City to finish college, which she did at the age of20, and stuck around for a long and fruitful career in journalism — first at The Salt Lake Tribune, then Salt Lake City Weekly, and for the past eight years at 15 Bytes. 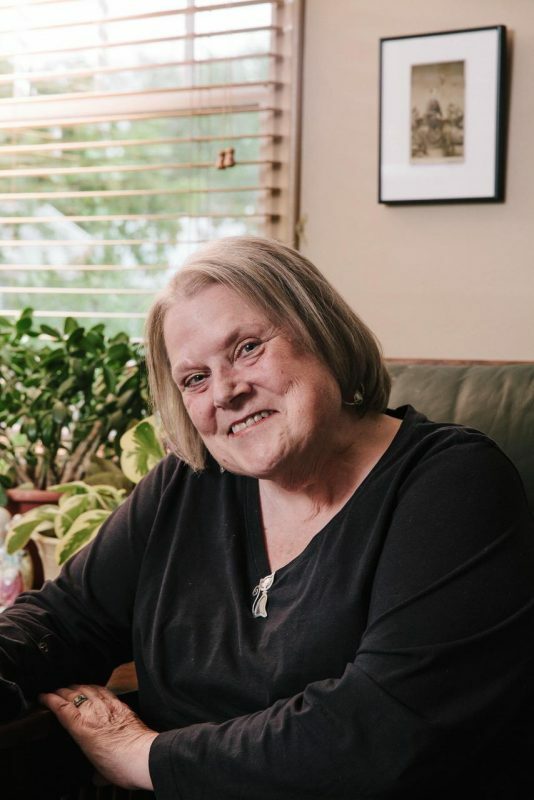 She is being honored this year for her illustrious writing career with a Salt Lake City Mayor’s Award in the Literary Arts, to be presented during the Utah Arts Festival. In addition to her work with the pen (as well as typewriter and keyboard), she has been a passionate patron and friend to artists — always eager to make them better known to an unsuspecting public — and even a curator: she put together a retrospective of work by George Dibble, called In Memoriam, that hung at BYU and the U, and her 1996 exhibit The Reality of Abstraction: Painting in Utah 1946-1996, toured for two years and opened up Utah’s eyes to the rich tradition of abstract art in the state. Rebecca Pyle, artist, friend and writer, decided to turn the tables on the veteran interviewer, and during a virtual conversation that lasted the better part of a day, talked with Ann about everything from scallops to Macbeth, and, of course, art. Q. To warm things up, I thought I would start with an Elf question (I once cried all the way through, in a large movie theater, the movie Elf): What’s your favorite color? A. I watched Elf, too, but I didn’t cry through it. Don’t know why. Maybe it was a different Elf. I like blue. Denim blue. Faded. Q. Has it always been your favorite color? A. Blue? Always, in some shade or another. I once briefly favored purple and orange as a combination. I even ordered a large ceramic chess set made in those colors. Don’t know what happened to it. Q. When this color or colors appear in dance, on theater stages, or in paintings — what does it usually signify, in your mind? A. The sky; the Virgin Mary; Alice in Wonderland; the Earth from space; a fine pair of paintings by Carolyn Coalson; Blue Nun— that’s a Lee Deffebach tin can sculpture I have. A. Maria Popova, an amazing mind who puts together a weekly thought piece called Brain Pickings – it’s free (donations welcome) and comes out online on Sundays – did a special piece a couple of weeks ago on “Two Hundred Years of Blue” in literature: Goethe, Thoreau, Virginia Woolf, Toni Morrison, others. She called blue a “more-than-color.” I like that. Q. You’ve told me you love the ocean food scallops. Where have you found the finest plate of scallops? Describe what was around you and this plate of scallops, and whether that influenced your scallops’ experience. On what color plate are scallops, in your opinion, best served, and what is beside them, with them? A. You are a loon, Rebecca! The finest plate of scallops I recall was at a place in Rhode Island that sat on a pier surrounded by ocean. It was my birthday a few years back and I had been at the Museum of Fine Arts in Boston all day (lucky me!) and we were on the way back to a friend’s studio where I was staying and stopped for a glass of wine and SCALLOPS, the perfect food (or maybe that’s bananas because you don’t have to cook them). They came on a white platter (this is appropriate) with Cole slaw (NOT dressed with mayo, mind you, but with something pungent and vinegary, with celery seed) and probably some sort of potato on the side though I don’t remember. I ordered scallops everywhere we went on that trip. Always excellent, but these were the best. Or at least the most memorable. Not Proustian-memorable, but worth recalling now that you ask. Probably because it was my birthday and I was surrounded by ocean. Atlantic Ocean: all those glassy greens instead of Pacific blues. Q. What is your favorite film? A. Must one have a favorite? Q. Your favorite most recently seen film? A. It was the film of a play, if that counts: Macbeth done by the National Theatre Company, London. Took my breath away. A. Why? It was Macbeth. Took place in a city torn apart, like Beirut. Very futuristic; very present day. They left off the witch’s first scene: “When shall we three meet again? In thunder, lightning, or in rain?” Which was a disappointment. But it was otherwise brilliant. Shivery. Those witches foretold it all. The same company did Hamlet with Benedict Cumberbatch last year – I followed it around the Valley and up to Park City and saw it three times. He’s the Barrymore, the Olivier of our age. I see everything I can that he does. Q. You’ve told me you were asked to criticize art, once, at The Salt Lake Tribune; you chose not to, saying you didn’t feel it was your place — to be criticizing art. Yet clearly it is almost a religion you live by, the arts — and that’s a thinking religion, and could not be done without constantly seeking what is most powerful in what you see before you. You feel then, that it’s private, your opinions? Or that the last thing you would want to do is discourage an artist? A. I don’t think I could do anything to discourage an artist. By that I mean I don’t DO art; I just write about it. I ask artists questions about what they do and why they do what they do. So I have no business criticizing art and no artist has any business taking anything critical I might say to heart. No artist would. The late George Dibble, my mentor long before I worked for the Tribune (he has a big show at SUU now), saw himself as a friend to the artist. Many wanted him to be more critical; they didn’t take George seriously sometimes. But the artists he wrote about knew when he was being critical of their work and the artists he didn’t write about in a show knew he was being critical of their work, too, in his way. When I first moved to Utah from San Diego I religiously began taking George’s column from the Sunday paper and visiting the galleries he wrote about, looking at those shows with him as a guide. I learned so much about art in Utah. And more about world art when Bob Olpin offered to let me audit his terrific art history class at the U. I am getting bolder in my dotage about writing critically about art. I do care about it. Passionately. And have come to know quite a bit about Utah art and its artists over these many years. I don’t tiptoe so much these days. A.Art is a gift; it’s vision. Art is utilizing every minute in some way that may not be apparent but is, somehow, essential. I am not an artist, of course. But I am fortunate to have many in my life who are. And I do try to learn what an artful life might be. That doesn’t mean I succeed in emulating one, far from it. But I, at least, know what I should be doing with my time. Q. You will laugh when I say this to you, but you have become a bit of an empress of the arts. I know you know many, many artists. Who are the ones, if someone came to Salt Lake City and had never heard of any of the artists here, whose work they must see? See their shows? A. I know a lot of artists, yes. That does not make me any sort of royalty, Tarot or otherwise (smile). I’d want them to see all the usual and fascinating suspects, of course, and I’ve written about a number, though not all of them. For studio visits I’d ask Denis Phillips, Tony Smith, Earl Jones, Trent Call and Trent Alvey, if she has settled into her new space. Maureen O’Hara Ure and Ed Bateman at the U. Oonju Chun’s and the other shows up at Bountiful Davis right now are said to be very much worth seeing – I have to get there. Teresa Jordan and Claudia Sisemore at Phillips is quite something – I’ll go back to that one readily. Beautifully hung show, remarkable work that shouldn’t work together as perfectly as it does. Cats and color fields – who’d have thought it? John Vehar-Evanoff has a show coming up this month at Modern West. While there we could check out Liberty Blake, Jann Haworth. I like Jeff Juhlin’s encaustics of the Western landscape at A Gallery a lot and he’s branching out into prints. For wanderers, with something to say about Utah and its culture, I’d pick Frank McEntire for his wonderful commentary on a variety of religious beliefs and an ability to explain what he means – and his new studio is staggering — while Kent Christensen takes some great jabs at Mormon dietary habits, though he shows more often in London than here. There are others, of course, but many more aren’t showing much now because they don’t have a gallery to show in. Or, more importantly, they’re dead. First off, though, I would take visitors to the Natural History Museum. I don’t get there often enough, as an artist friend just pointed out the other day. Q. I must know what your favorite fairy tale is. Is art seeking the solutions of fairy tales, the balance of rights and wrongs, the following intuition — against terrible or at least unlikely odds? A. Peter Pan. And I am, of course, very much of the Lord of the Rings generation. Maybe art is never quite letting go of the perceptions of childhood. Finding beauty in ordinary things. Q. Which brings me to the next question: what is art? If you had to explain it to someone from another universe, or a child, or to yourself? Is it a medicine of sorts? A.I think I’ve done all I want to with this question. Art/not art. Good art/bad art. Not very erudite today. In fact, this will be one interview where the questions are more interesting to read than the answers. Be sure to put that in. Q. An odd question: is geography what defines us most? If we let it. There are books. And trains. Q. What is your favorite mix of galleries on a gallery stroll night, and what do you look forward to in those galleries? A.I usually head to Phillips and Modern West, then either west to NOX and Art Access (though less often to the latter since I don’t get emails about their shows as often anymore) and the occasional gallery in between; or east to A Gallery and Finch Lane. It depends entirely on who the artists are. I always go back on another day, anyway. You can’t see a show properly during a stroll because of all the people, but you do want to hear what they have to say and say hey to your friends and some of the artists, which is kind of the point. And Phillips now does gallery Q&A’s at 5 p.m. and Modern West has artist talks at 6:30 so it’s always worth going out to learn something new and enriching. MoWest had a panel discussion last stroll on the Mandelman & Ribak show with speakers that included the director of the gallery in New York City which holds the collection, and 15 Bytes’ own brilliant critic Geoff Wichert whom everyone seemed to want to ask questions of —and well, Rebecca, we went together, so you know! Sometimes, on the way home, I hit Karen Horne’s place, if I’m not too tired and there’s a place to park. Q. In your house, what is your most beloved painting? I know you have a few. A. The Deffebach abstract. Though I’m terribly fond of the monotype of McGraw, Lee’s cat, too. She did that when she went to graduate school in the ‘80s. Can you imagine having to teach art to the great Lee Deffebach? Bet she was nothing but appreciative. I know she loved the print class. And I love the painting George Dibble left me. Q. I’ve never known anyone else with a cat named “Fearless.” It sounds like the name of a cat a mystery writer would have. A.I would enjoy being a mystery writer. Q. How did you choose his name? A. Fearless is terrified of everything and everyone except me – and he was afraid of me for years. His full name is “Fearless the Feral Cat.” I told Shawn [Rossiter] I should have named him “Buttercup” and then people wouldn’t ask me that question. Irony is out of fashion. Q. What is your feeling about art and politics (not the politics of one color against another on the color wheel, or circle vs. oval, or dark vs. light, those artist politics)? Some artists are extremely politically involved; others eschew (I hope that’s the right word) — they don’t think politics should touch art. How do you feel, or do you sympathize with both? A. Ever since Jesse Helms and the NEA, current U.S. artists have had to be aware of politics that impact their world and work. Art has been affected by politics since Ancient Greece, of course. I am very political, always have been. Q. And there’s a question I almost left out, which you will adore (!) and will be educational for me: what’s the secret of interviewing people? A. Oh, gosh, it varies with the person being interviewed and what kinds of things you want to find out. How long the story will be, all of that. But an interview is a conversation, I think. Not a meandering one, except at the start, when you are getting your bearings and establishing a level of trust, but one with a purpose. Had we actually been speaking one on one, I would have expected you to ask me, above, what I saw at MOA Boston that I liked. And I would have said there was an amazing visiting Hokusai exhibition that took up several galleries and that the van Gogh paintings were thrilling. You’d have had to make a choice there and let’s say you went with van Gogh instead of Japanese art. We would have kicked that around for a bit, you telling me he is an influence on your own work, etc., and that would have led to my confessing a love of abstraction. Eventually I might have said that looking at Mark Knudsen’s paintings, and at Francis Zimbeaux’s patiently over time has given me an appreciation of representation that surprised me. Surprises me still. I might have added that my interest was fueled by the British landscape show at UMFA in 2015, and we would have gone from there. I try to ask unusual questions, to spark off something unexpected, though, in order to get interesting answers. My favorite interview, since you didn’t ask, was with Lee Deffebach. It started like this: “I paint the paintings I do because I like to look at them. What more can you say? I like to just mess around with color, get a feeling and paint an emotion. I like to suggest things and let people see whatever they want. I don’t like to tell them anything or instruct anyone – just suggest. You can make a whole story out of that, can’t you?” She truly thought that was the end of the interview. I hadn’t even asked her a question yet. And I had a Sunday Tribune Arts cover to fill. Back when that was a lot of space. Fortunately, Sam Wilson dropped by, the wine came out, and shy Lee started to talk. To Sam. I was so relieved. And it was a good story. Ann Poore is one of my favorite people. Ann is extremely talented and a wonderful lady. I am grateful she shares her world with us.